New York is a strange town for menswear. It’s a bit of a Wild West, without the same traditions of Europe and with bespoke largely undermined by visitors from Savile Row. If there is a tradition, it is for value: low-priced sack suits that are constantly on offer. So where does the crafted, sartorial menswear that we love fit in? Around the edges. In imports like the Armoury, online warehouses like No Man Walks Alone, and the odd diamond in the rough – such as Leffot. The only way in which New York really has an advantage over London is that its conservative male shoppers have managed to keep traditional department stores alive and strong. In London, there is too much fashion (Selfridge’s) and too much bling (Harrod’s). Bergdorf Goodman and Paul Stuart have survived because there are enough well-enough Americans that value traditional menswear. We have a lot to thank those men for. Not least the fact that most Savile Row tailors would have gone out of business years ago were it not for them. Top only because it was first. I still remember clearly walking into Leffot the week it opened, and thinking what a breath of fresh air it was. Years later, it remains the best shoe shop in New York, and probably the whole of America. The New York branch (pictured) of the shop founded in Hong Kong. Responsible not just for bringing great brands like Ring Jacket, St Crispin’s and Carmina to New York, but also for a regular series of bespoke artisans. Paul Stuart has always been one of my favourite stores in the world. It is how all great menswear stores should be, chock full of well-made, classically styled clothing and accessories, with free alterations and knowledgeable staff. The sock selection alone is worth a visit. Style has improved with the launch of Phineas Cole, and since the lovely Ralph Auriemma took over the main Paul Stuart line. As mentioned above, Bergdorf’s has managed to remain a traditional (luxury) department store. There is a tie section, there is swimwear section. There are several effective shop-in-shops too, but it still feels like everything is arranged by category. The windows, unfortunately, are now more arranged by brand. They used to be simply inspirational in their classic styling. No Man Walks Alone is an online retailer, rather than a store, but anyone can contact the guys and make an appointment to visit their warehouse on 37th street. Great for Italian tailoring brands like Formosa, and for MTO programmes with the likes of Vass and Rota. Bespoke tailors have a hard time in New York, because Savile Row has been coming here for such a long time and has a committed client base. Len Logsdail is one Englishman who stayed, and he cuts a very fine suit. Also worth of mention are Nino Corvato, Cheo Park, the establishment that is Martin Greenfield and the soft tailoring of Mark Rykken at Paul Stuart. Oh, and of course Alan Flusser – if you grew up with Dressing the Man, always worth a visit. Listed here for its style more than anything else. I have no direct experience of the tailoring, but I’ve always liked Kirk’s view on contemporary male style, and he stocks some nice accessories too. Mostly clothing sold under their own label, all made in Europe and North America. Some great knitwear, suits made by Samuelsohn and shoes from Alden and Vass. Also a good MTO program for trousers and shoes. In rather the same vein as I included Giorgio Armani in Milan, the Rhinelander Mansion has to be mentioned in New York. There are millions of Ralph Lauren shops, but none of them are quite like this one. A nicely curated selection of brands from Japan, Italy and the US. Tends more towards to casual clothing featuring unstructured blazers and wool trousers mixed in with high-end T-shirts and denim. Also has a MTM program for suits (as many New York outfits do – unfortunately often calling it bespoke). One of very few bespoke shoemakers in New York. The maker Ramon makes for Gay Talese among others. Most of the tailoring at Freeman’s Sporting Club is a little too narrow and short for my tastes, but I love the atmosphere of the shop and the styling. In much the same way as I always find it interesting looking at the tailoring at RRL. Worth a visit. Designed by Orlando Palacios, this is probably the best hat shop in New York. A key strength is the blending of classic styles with some more modern colours and shapes. Most hat shops are either very traditional or very young and funky. Palacios’s designs manage to reach across the two. As you would expect, New York has a great range of denim shops. The Levi’s store in the Meatpacking District is worth listing for its bespoke jeans, which I can highly recommend having had them in London. Self Edge and Blue in Green have a good range of Japanese brands – and a chain-stitch machine. As with tailors and cordwainers, New York is lacking good bespoke shirtmakers, but if you want someone local then both Geneva and Cego custom shirts are worth a try. The only other thing worth mentioning is that New York has a very strong range of Italian tailoring brands that – until recently – we didn’t really see in Europe. Brands like Isaia and Belvest – and at one point Kiton and Attolini – weren’t over here at all. As ever, any other suggestions welcome. You can follow the discussion on New York: A sartorial city guide by entering your email address in the box below. You will then receive an email every time a new comment is added. These will also contain a link to a page where you can stop the alerts, and remove all of your related data from the site. What’s always left off these lists are the direct MTM men, like me, who bring their point of view and patterns to gentleman in New York and cities throughout the country. A few of us use the same factories as the names mentioned in the above article. All of us bring passion and love to our work. Great list Simon. Epaulet, the Armoury and NMWA are always top of my list when I’m in New York. For shirts, I can also recommend Kamakura; particularly the buttondowns and semi-spreads. Good construction and a large range of sizes – certainly decent value for money. Indeed, one of the bespoke shirt makers on your list was amazed at how Kamakura could possibly sell the shirts at the price they did. Honourable mention for the honourable Lord Willy’s, Mott St.
Dear Simon, firstly, I just wanted to say that I’m a huge admirer of the work you do. Keep it up!! Um, my question is not related to this post, but I’m thinking of investing in a bespoke leather jacket (as outerwear). Would be great to get your advise here and know the best option there is. I remember the bespoke jacket you commissioned from Gieves & Hawkes, but I’m looking for something really different, where there are no limitations in terms of design and color options. I was thinking Cifonelli, but you’re the expert. My budget is around 7000-8000 euros. Thank you so much. What a wonderful project to have. There would be no limit to design and colour at Gieves, with Davide. Or indeed with Cifonelli. From my experience so far, I would go to Cifonelli for something more like a standard jacket, but in leather, and Davide for something that requires more design. You will likely also get a higher level of finish at Cifonelli. Also, it’s worth having something that is fairly fitted. If all you want is a loose blouson, there’s much less point having it bespoke. I hope that’s helpful. Good luck! Hi Simon. Thank you again for compiling this list. For bespoke/MTM operations, I would recommend David Reeves in NYC and Franco Ercole in Brooklyn. They produce impressive work. Very nice list. Leffot, Paul Stuart and Armoury are my personal favorites. NMWA has an impressive range, awfully slow website. Agree on the shirtmaker issue. RTW unfortunately is better in some ways than some of the MTM guys, though with less selection. CEGO is ok, but a block over from Paul Stuart is the Japanese Kamakura – nice selection of shirts, ties, and squares. The classic Brooks Brothers is still a store to visit, but really only the one on Madison. Bergdorf has some fantastic luxury items, but the selection is no where near as intelligent and edited as Barneys. Its a personal favorite as far as the big B (the former + Bloomingdales) stores go. New York is a strange town, period. I have never worked with CEGO but I have worked extensively with Geneva. They can make good shirts, and are very patient, but in my experience they have moved slightly towards a production line and away from a small workshop: the extent of the customization is somewhat limited, sometimes quality is inconsistent or details are missed, and most importantly, you don’t deal directly with the pattern maker. Atam Sahmanian’s Paris Custom Shirtmakers is slightly more expensive, but if you want truly bespoke in terms of experience, personal relationship with cutter, superlative quality of materials (including range of vintage and dead stock), and infinite customization, it is my choice in NYC. I have never tried Alexander Kabbaz. 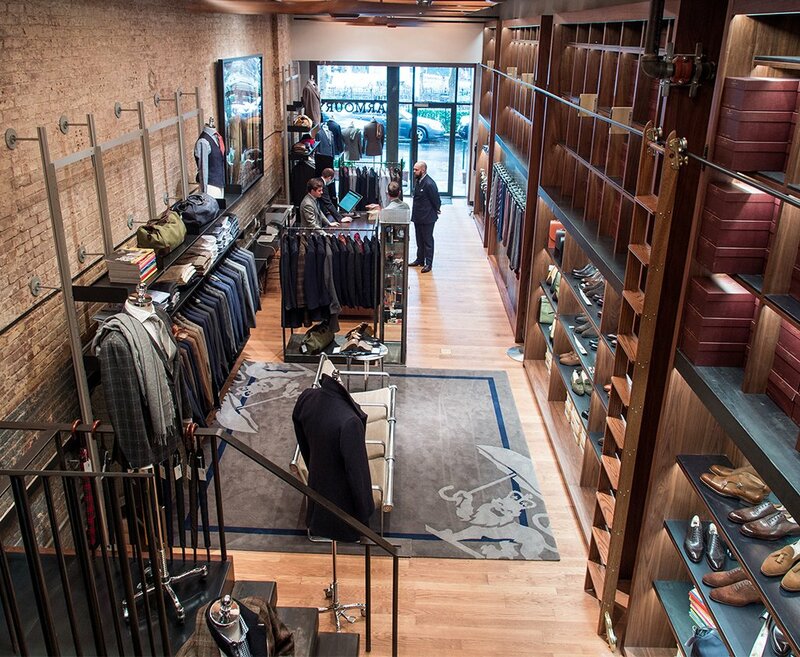 Bespoke NYC – Anon here. My understanding is that Kamakura only has two overseas stores, both in NYC, so it’s something of a rarity outside of Japan. Agreed the shirts are slim fitting. Anon – you’re absolutely right, although they have about 25 stores in Japan so I’d still describe it more as an overseas outpost, rather than an exclusively NY shopping experience (much like the Turnbull & Asser or John Lobb stores are outposts of their London operations, rather than distinct destinations in their own right.) And of course none of that detracts from the benefits of not having to go overseas to buy their products! No mention of Elliott’s. Madison and Lexington. Very cool. Yes. Peter Elliot is a fantastic shop, which many clothes made especially for them. I have some of their trousers made by Hertling in New York. Too bad they had to move one of their shops to a much smaller space across the street. I worked in NYC for ten years and only returned to Blighty in 2010. I love the place to bits but next to London, it is and remains a sartorial desert. I spent a couple of nights there on business a fortnight ago. Anticipating autumnal weather I’d packed a flannel suit and a 14oz wool three piece for daywear. Huge mistake. The weather was similar to the UK in midsummer and the humidity was oppressive. I salute anyone that manages to maintain even the vestiges of sartorial standards in such a climate. If I had to live there then I’m sure I’d spend at least 10 months of the year in fresco and linen. Great article! “Film Noir Buff” sometime ago mentioned another custom shirt maker that only does custom work and does not farm out any work. All work is done in house, and they are located on West 32nd St, I believe on the 6th floor. It is called Paris Custom Shirts. Unfortunately, as far as I can tell, they do not have a website. P. S. DO NOT CONFUSE WITH LISTE ROUGE, who are located also in NYC, and are also pretty good. However, Paris Custom Shirts are MUCH better! BespokeNYC, Anon – Agreed the shirts are on the slimmer side and for that matter not a NYC store. My exuberance is due to the the NY Slim fitting just about perfectly on my frame. The regular NY cut is reasonably generous, but definitely not a BB Madison. Also, I forgot to mention the coolness/casual factor of Gentry – relatively new, but oh so comfy. Not as sophisticated as NMWA, but geared for a younger and somewhat edgier crowd. Simon, one name that is often overlooked is Saint Laurie Merchant Tailor. They are the oldest shop in Manhattan having been around since 1913 and do very good work. Fully canvassed, hand stitched, and made in their workshop on the same floor as the showroom in midtown. They also have one of the best selections of vintage fabrics I’ve seen. Andy, the current, third generation owner, is very keen on the Scottish mills. They also own a dedicated shirt factory in New Jersey where they exclusively do their shirtmaking. We know some of these names, but I’m looking forward to our next trip states-side to check the others out! you new yourk guide is absolutely fine. finally something new to discover. the sad is to see how rare and rarefact is craftmanship in u.s.a. it seems none of the old good names of the new world survived. names like sulka & co., kauffman & sons – just to mention two – are either disappeared or transformed into shabby shops. it’s a shame, cause the quality of american garments and accesories was among the very best. sometimes unique. You may consider including Warren Edwards. Offers hand made shoes of his own design, excellent quality and known for using exotic skins. Was half of ’80’s famous team Susan Bennis/Warren Edwards. If you like Alden shoes, as I do, then their store on Madison Avenue is worth a look. I agree, it’s a bit staid, but they do often have otherwise difficult to find make-ups such as the natural chromexcel Indy boots I have on my feet right now! I think any discussion of New York style purveyors for men has to include Barneys. They’ve fallen a bit from their perch at the very top of the heap, but this is the store that introduced Giorgio Armani to America. They also do a strong trade in made-to-measure from a number of English and Italian brands. It’s not Savile Row, but that’s why there’s Savile Row. i was in barneys last year. The actual menswear section was awful. i could not wait to get out of there. – think the worst parts of selfridges, harrods and HN rolled into one. The ground floor however i found great. An great selection of fragrance, and i have someone very helpful at the counter assisting me, great eye wear (not just your usual Rayban and Gucci everywhere) and also a lovely selection of vintage watches. Its like liberty downstairs and Zoolander’s closet upstairs. If you like the style on this site, you would not like the runway show, high end style that Barneys sell. BUT if you actually like Yamamoto or Prada, then Barneys is the best one-stop shop in America. And the staff are pretty helpful too. Of the names mentioned there are quite a few that I can speak to. Barneys is WAY too fashion orientated (albeit you can find a few items here and there) plus once they left Chelsea it was over for me and Barneys : ( Bergdorfs is definitely less fashion orientated though they seem to be heading in that direction as well. I agree Polo’s Rhinelander Mansion is exquisite and their MTM is quite good although the prices are creeping up towards bespoke. Paul Stuart got a boost with the Phineas Cole line and is still quite nice for finding classic menswear accessories but they seem to lack in their collection of top shelf products. Leffot and the Armoury are definitely the cream of the crop while Freeman’s Sporting Club and Epaulet are on the decline towards uninspired ready to wear. NMWA doesn’t seem like a retail spot as Simon said but I do like some of their selections. Unfortunately, the lack of dedicated retail space holds me back in giving a full ‘thumbs up’ them. Franco Ercole (mentioned above in the comments) does very nice work but their lack of attention to details and poor communication can be tiresome. Finally, Miller’s Oath is a great space and they have a great selection of Fox Brothers cloth at the ready but I too have not taken the plunge and had anything bespoke made there. Hopefully soon. In closing, I would say that while there is nothing else close to the sartorial selections offered elsewhere in the USA I am thankful that the bespoke Neopolitans, Londoners, Japanese, etc. are still making regular visits to ‘Gotham’. Secomd the honourable mention of Lord Willy’s. Years since I’ve been to NYC and LW, however it was a great experience. Matt, don’t forget that, while the summers are hotter and more humid here, the winters are much colder and longer than in London. Please don’t wear linen and fresco if you come any time between November and April or you’ll freeze! It would be interesting to see what you would recommend for San Francisco/Bay Area. We have Self Edge and Levi’s. It’s just so casual here. Will, from A Suitable Wardrobe, may have something different to say. Bespoke business casual is what I’m looking for I guess, so not quite suit and tie and not blue dress shirt and khakis. Rebron, have Anderson & Sheppard make you a single breasted suit in in needle cord mid blue. It will be perfect for SF in terms of both style and climate and you can pair it with flannel shirts and or knitwear. Think Bryan Ferry meets Steve McQueen in Bullitt 2 the sartorial sequel! I’m good, just curious. I have a pretty good (A&S alum) tailor and I think we’ve worked out a pretty good wardrobe over the last several years in the formal/casual range. People here dress poorly even those who think they’re dressing well, so no matter what I’m usually overdressed. I think the knitwear comment is right. It’s the warm weather (but not tropical!) plus casual lifestyle that makes it more of a challenge. I guess the next post New Yorkers would be hungry for would be a comprehensive list of the visiting tailors. The New York guide is terrific. Ditto the London guide. Have you the same type of guide for Paris? If not, I would be much obliged if you could reel off the first dozen places that come to mind. Many thanks. 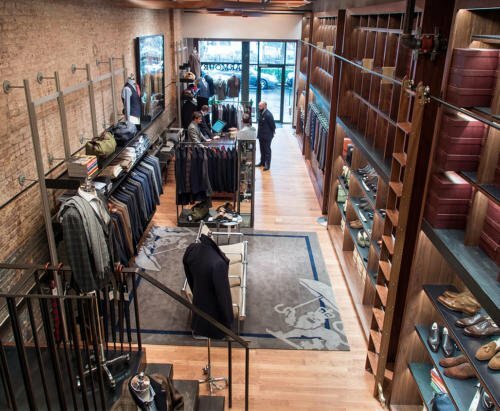 Have you been to Seigo neckwear on the upper west side? If not, it’s worth a visit next time you’re in New York. Agree about Paul Stuart. Last time I was in NYC I stopped in there and purchased a few ties and socks – modest as these things go. The next week I received a hand-written note from the salesman. Simon, readers, any advice/recommendations on bespoke tailors in Washington, DC? A question only vaguely related to this particular post. I’m holidaying in Japan in August, and am not having much luck uncovering where the good, classic menswear shops in Tokyo are. I know Dunhill in the Ginza district is worth a look, with a bar and barbershop as part of the offering, and Brycelands I’ve heard of, but I was wondering if you had picked up any other names from the people that you meet in your travels to Pitti and the like? I’m planning a city guide on it soon, but not until I go again I’m afraid. There are lots of shops though – Beams, Isetan, United Arrows, Tomorrowland etc. Thanks Simon, if I stumble across anything special I’ll be sure to let you know. Hello Simon. What happened to your most recent guide to NYC tailoring? I found it very useful and was using it as a reference piece. Hi Gerry – it’s being republished in an updated version tomorrow. Simon – do you have a sartorial guide to Tokyo? Love your blog and truly enjoy all of the advice and photos. I’m a fourth generation New Yorker and have luckily never had to buy a suit. So many of my grandfather’s bespoke suits fit me very well that I have never had the reason to go out and procure one until recently. I’d very much like to get a bespoke suit done here in the city. I know that Huntsman has opened up a shop on 57th Street, but I was wondering if you know of any other bespoke suitmakers here in NYC? “…the establishment that is Martin Greenfield” seems tongue in cheek. Did you list Greenfield out of obligation to his NYC longevity and/or interesting backstory – or his sartorial skills? Understand he’s MTM and not bespoke – but what is your purpose of listing him? Thanks for the great work that you do! An update: I received my Martin Greenfield suit the other day in the mail. I did two visits to his Brooklyn, NY shop: first visit to pick cloth, discuss style, get measured, then second visit was two months later to do the fitting. Then they mailed the suit to me. The 3-piece suit fits nicely, if snug, somewhat British look. That’s what I wanted. Total price $2,232. Additional expense – Had to fly from Charlotte, North Carolina to NYC twice for the two visits. But I believe this was still a very fair deal. Epaulet as left NYC for the West coast! Thanks, yes this guide is in need of an update. Independent stores come and go so fast…. Cheo Park, mentored under Len Logsdail is the Cheo I mentioned to you some time ago when you listed NYC bespoke tailors without mentioning him.